One interesting little fact I've discovered is that if I input a picture from elsewhere (photoshop, for example) the engraver software reduces it by 58%! A bit bizarre as it's a funny figure and took a bit of testing and calculating to prove it. The software might be pretty rudimentary, although adequate, but it seems a bit strange. It also occasionally won't print and the software needs to be re-started, no big deal, just annoying. When it prints though it's great. I've noticed that too. I find if I up the resolution from 72x72 to 150x150, it's not as bad. I also double the size of the image I'm working on so if I want a final image of 2"x3", I make my image in GIMP 4"x6"
What engraver do you have? I have the SixDu 80mm 1500mw and run it under windows 7. There was recently an update that caused mine to stop at 5minutes. Removed the update (it's a virtual machine so don't really care about security on it) and it's working great again. Of what? finished items or where things mess up? 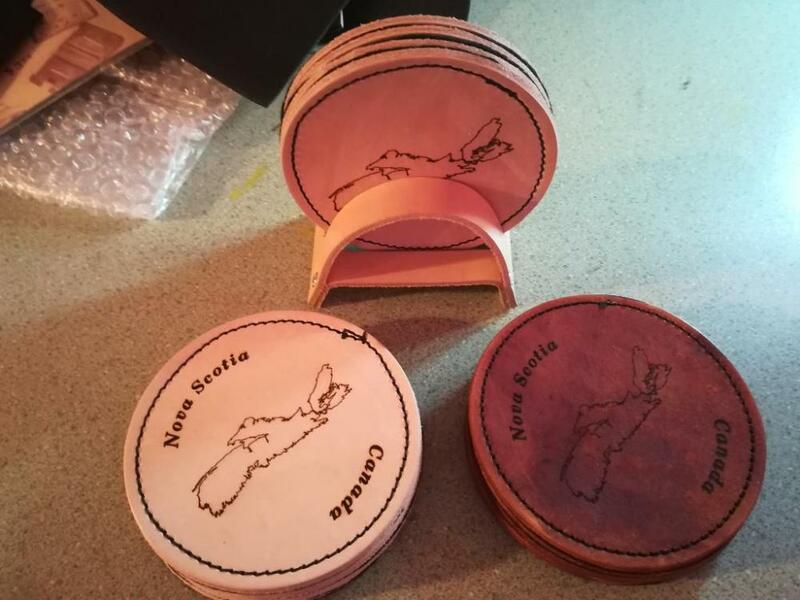 Some cool laser work.How long does it take to cut out those designs on the key rings? 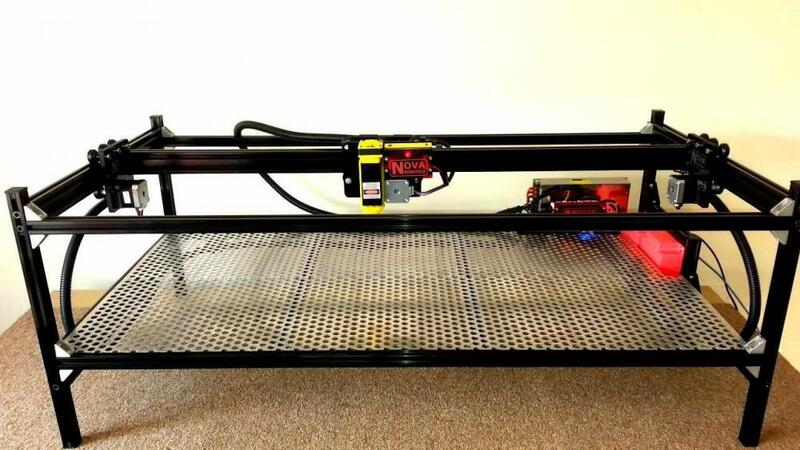 This may be of interest to people wanting to laser more or bigger parts - 15 watt power, 800mm x 400mm work area. Tt can be flat packet into 3 chunks for compact shipping world wide. There is also a version with complete exhaust extraction, air assist at cutting area, Safety viewing lens drop down over cut area for office use. Nice, but the main reason I bought the little one is it takes up very little space. I intended buying/building a bigger one initially until I realised I had nowhere to put it!! I have not tried it yet but I remember seeing something about the reduced size problems in there somewhere. Their camera software looks very interesting as well. Thanks Brian, I'll have a read through there later. I did find an alternative bit of software but it wouldn't work with my engraver. I have a little project that I have to finish first (before Easter). Something I just tried. Our police carry an official notebook (for taking statements etc) and are supplied with a "folder" to hold it, which is your basic cheapy vinyl thing. 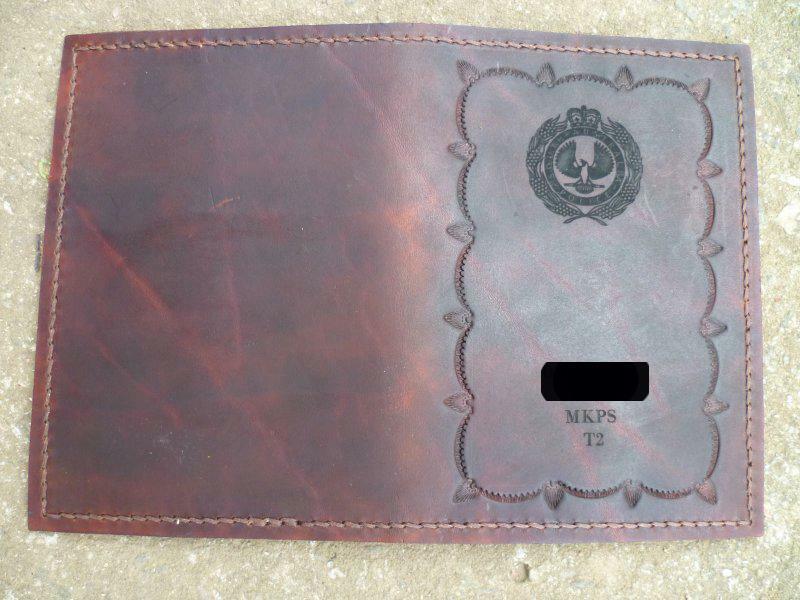 When I had my recent firearm safe inspection the officer mentioned this and asked if I could make a leather folder for his notebook. When he came around to discuss it he asked if I could make one for a colleague who just got promoted and could I stamp her name on it? I said I could probably engrave it and to leave it with me. I thought I could do something a bit better in that case so did a bit of basic stamping and engraved the SA Police logo and her name, number, station and group (I blacked out her name and number). The engraving went well and I dyed it with Tan dye, in the photo it looks light but in reality it's quite dark and tends to make the engraving a bit hard to see but I thought it was more subtle that way. I machine stitched the edge in white but didn't really like it so removed the stitching and hand stitched it - looks much better. All this waffle is to say that the little laser let me do something that I couldn't have achieved otherwise. I know a bloke running an 80 watt CO2 laser that (I think) came with proprietary software called RD Works. He has tried Lightburn, he reckons Lightburn is much easier to use and has some really good features. We had that discussion a few weeks ago in a FB group that I'm in. Basically a few of the old time "gods" basically feel anything not done by hand (including stitching) is not hand made or leather work. 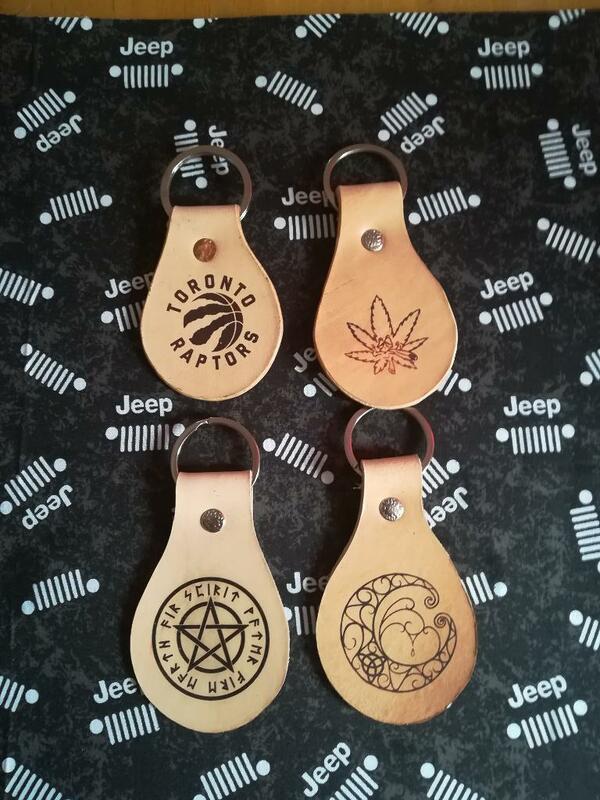 Laser engraving is just cheapening the craft and they would rather do a key fob by hand, take an hour of their time and make nothing on the job over doing a laser engraving on the keyfob and spend their time doing something where they can make money. That is entirely their own choice. IMHO, it only becomes a problem when/if they try to tell me, I MUST do things their way. Of course, that problem can be dealt with by ignoring their point of view. The only time they have any say in how I do something, is if they are paying me to do it their way. If it was up to them, we'd still be using whale oil to light lanterns, horse and buggy would still be our method of transportation and food would be saved by salting only. All this waffle is to say that the little laser let me do something that I couldn't have achieved otherwise. Firstly I will say that the cover has come out very nicely. As to your last comment I think that hardly any here, could have achieved that level of detail in the badge part without the laser process. Those that could..... would not come near to doing it for a price that all but a very few could pay you for. WELL DONE!!! Thanks mate, I was about to make a similar comment about the detail in the emblem. There's NO way I would even attempt that if I didn't have the engraver. Likewise with the name etc, my stamps are all too big. While I like the idea of something being entirely handmade, realistically cost can sometimes become an issue. I have no qualms about using modern technology within reason, although I must admit I still like handstitched items compared to machine stitching. 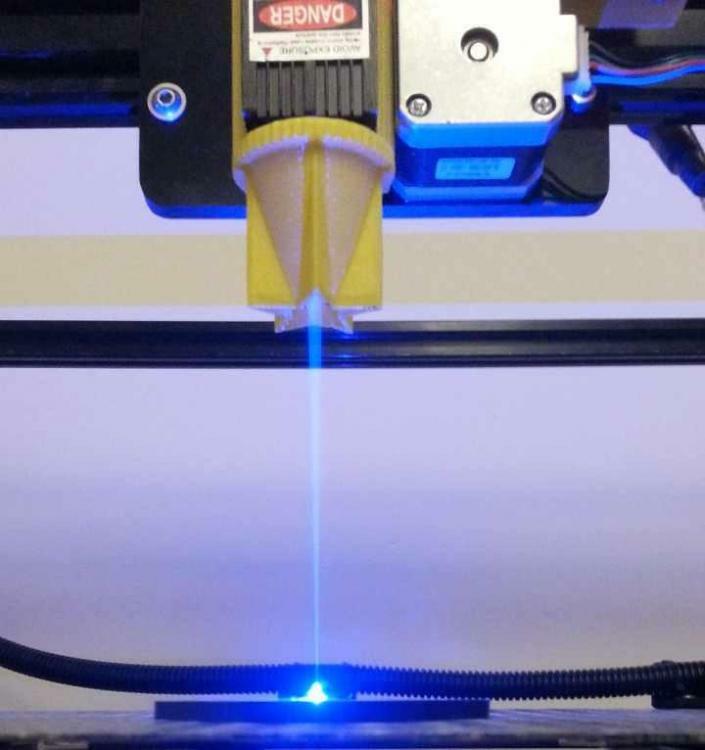 I've been looking at Lightburn, but I'm not sure it's designed to work with these little engravers as it requires specifying the hardware/firmware being used and I have no idea what this thing uses! I have found some software called Scarve so I'll try that. I have no qualms about using modern technology within reason, although I must admit I still like handstitched items compared to machine stitching. I have found some software called Scarve so I'll try that. You probably won't need that many holes for the vacuum to hold it down, another way might be to use a thin cut-off wheel in the grinder and cut a series of thin slots instead of holes? It would be quicker and easier than drilling lots of holes and should work. Looks like Lightburn is a no-go, it can't recognize the device. I mentioned Scarve before but that looks like it's an even simpler bit of software than what I have! Guess I'll just have to stick with what I have, while it has its limitations it's not too bad - when it works.